iMovie, iTunes, iPod, Diskburner and Final Cut Pro ready! CBFW2 is a first shipped(June, 1999) OHCI based FireWire CardBus Card for PowerBookG3 and has the Apple official qualification for Final Cut Pro. CBFW2 has been shipped over 3 years and improved a silicon and driver software. The current version is fully compatible with Apple FireWire Drivers, iMovie, iTunes, iPod, Diskburner and Final Cut Pro. Also CBFW2 works fine with Adobe Premiere or third party FireWire based software and FireWire devices. Important notice to iPod owners! Cable Power Adapter(CFW-CPA, sold separately) must be attached to CBFW2 to provide the power to iPod through the FireWire Cable. Adds tow External FireWire ports. Full backward compatibility to IEEEE1394-1995 device. Fully compatible with Apple MacOS8.6/9.x FireWire Drivers. Fully compatible with Apple MacOSX FireWire drivers(CBFW2 Rev.2). * RATOC original MacOSX drivers are required for CBFW2 Rev.1. Learn more at Software Download page. 100,200 and 400 Mbps data rate is automatically supported at each FireWire port. Class 1(15W) cable power is available at FireWire port with optional power adapter(CBFW-CPA, sold separately). Fully compliant with PC Card Standard 7.0. 32-bit Bus-mastering data transfer and 33MHz operation. FireWire Storage devices -HDD RATOC, VST, Lacie, QPS,Maxtor, Western Digital and more. -CD-RW RATOC, SONY, YAMAHA, QPS, VST and more. - PC Card Standard 7.0 / CardBus spec. compliant. 32bit data bus, bus master DMA transfer capability. - 100,200 or 400 Mbps operation. Automatic detect and negotiation. - Operational Voltage: 3.3V/DC +/- 0.3V. * DV capturing frame rate depends on CPU speed, Memory size, software, and Hard Disk sustained data write rate. You need more than 11MB/Sec. sustained data write rate HD. - CardBus PC Card slot Power requirement. 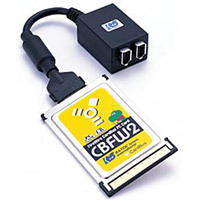 CBFW2 FireWire CardBus PC Card. "Edit Video Like a Professional"
Video capture is all digital - no digitization or additional compression is required. Professional features including high quality transitions, real-time cuts only playback and unlimited access to powerful on-screen WYSIWYG video titling. 2 6Pin Firewire ports and 1 AC Adapter port. Microsoft Windows® is a registered trademark of Microsoft Corporation in the U.S. and other countries. Macintosh® is a registered trademark, and Power Macintosh, Mac OS 9, Mac OS X, FireWire are trademarks of Apple Computer. All other products, services, names and registered trademarks are trademarks of respective companies.